Handle your most demanding stretch wrap applications with the Wulftec SMHPA-300. This heavy-duty pallet wrap machine is made with a durable chain and steel construction and built to stand up to 8,000-pound loads. Backed by a five-year unlimited cycle warranty, this industrial-grade machine comes complete with a high-profile base – ideal for heavier loads with smaller footprints. Get started with an SMHPA-300 to streamline packaging line efficiency while creating professional, uniform pallet loads. 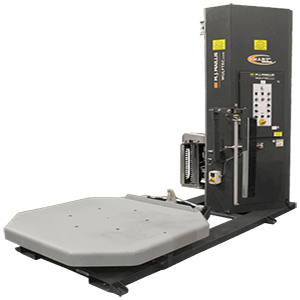 To learn more about the Wulftec SMHPA-300 Automatic Turntable Stretch Wrapper, give us a call at (609) 337-3641 or request a quote online. Hughes Enterprises offers 24/7 on-site maintenance and support services, so you never have to wonder who to call when downtime strikes. Whether you’re looking for installation assistance, routine maintenance or emergency support, reach out to discuss your needs with a factory certified support technician.